Trying to figure out which Kitchenaid mixer to buy for home use? There’s something about the brand that makes most people feel that they should only consider one of their lines. One of the reasons is that Kitchenaid makes several attachments and accessories to go with all their stand mixers. If you decide to get a cheaper model now that will be just right for existing needs but later want to do something more with it, or get one Kitchenaid mixer now and get a different model in five or ten years, you can buy one or more attachments and accessories and they should all be compatible unless the company does a drastic redesign. Here are what we think are the best Kitchenaid stand mixer attachments. There are several types of mixers that you can buy but it can get confusing if you try to compare all of them together. This Kitchenaid stand mixer comparison guide focuses on just the Classic, Classic Plus and Artisan series which all feature the tilt head design. We’ll cover the higher priced and more robust bowl lift models in another review soon. The tilt head design is usually cheaper and gives the user an easy way to add and mix ingredients because the head can be tilted up and backwards when the unit is off. Because there is a moving part in the tilt head, you cannot expect it to last long if you force it to do very heavy tasks like kneading big batches of heavy yeast dough. However, these are more than adequate for small batches of bread dough, pancake, cake and soft cookie batter and meringues. This design is low profile, so these mixers can easily fit on your counter under standard upper kitchen cabinets. If you’re most interested in making lots of bread of all kinds and in big batches, I suggest you take a look at our reviews of stand mixers that are well built for bread making. We review the KitchenAid Classic Vs. Classic Plus Vs. Artisan stand mixers to show you what the differences are. Keep in mind that all these mixers can be upgraded by buying certain attachments to go along with them. Farther down the page, we’ll show you some popular bundles that many people get when they buy each of these 3 mixers. All these are heavy and bulky and you may find it hard to make space on your counter if you have a small kitchen. If that’s the case, take a look at the 2016 released KitchenAid Artisan Mini stand mixer, which is smaller and lighter than the Classic but has the same power and features. If you have ever pictured a KitchenAid mixer, this would be the kind that first comes to mind. The KitchenAid Classic, is heavy, powerful and has been a mainstay of the company for decades. The overall design hasn’t changed much, and for good reason. As the old saying goes, “If it aint broke, don’t fix it,” and the Classic is a winner that has become a legend in its own time. There is a reason that this mixer is considered the cream of the crop. The single mixing beater, rotating in a planetary or circular motion, is the part that moves, not the bowl. This arrangement gives almost complete mixing coverage, so you won’t have to use a spatula to remove unmixed sticky batter or dough from the bowl sides. Among the standard accessories like a 4.5 quart bowl, nylon-coated dough hook and a flat beater and a wire whisk, you can get optional add-ons like a juicer, a grinder and even a slicer/shredder that attach to the power hub port at the front. These additional attachments number a whopping 15! You can even get bowl covers to store your mixed batter or dough if you can’t use it right away, a pouring shield for precise addition of ingredients directly into bowl, and many other different accessories too. The motor is rated at 250 watts, but that’s enough mojo to mix bread and cookie dough only on an occasional basis, and there are 10 separate speeds so you’ll always have the speed you need no matter what you are mixing together. Choose from two colors, either black or white. The KitchenAid Classic Plus gives you virtually everything that the Classic does, the same accessories, the same power hub port, the same planetary beater action. They are virtually the same except for one small difference. Where the Classic has only 250 watts of power, the Classic Plus has 275 watts of power. Now, that may not sound like a lot, but remember, the more powerful a motor is, the less strain it will undergo to overcome any mixing or beating task, and ultimately, the longer it will last. And although you would not want to knead bread dough on a regular basis with this unit, because even 275 watts is a bit down on power for that, it will be a bit more capable than the regular Classic. The other main difference is that the Classic Plus only comes in the color white. That may sound petty, but if you want optional colors, you’ll have to look elsewhere. 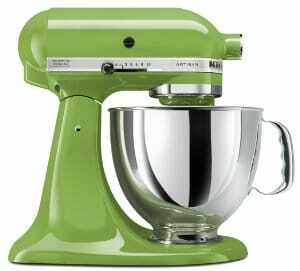 The Artisan Series of KitchenAid Mixers gives you 28 choices of colors. From blues to purples, yellows to oranges and everything in between. Better still, you get a power upgrade to 325 watts, which makes this a more powerful alternative for mixing doughs on a regular basis. It comes with a unique 5 quart single handle bowl, which makes grasping and pouring that much easier. And unlike the other KitchenAid mixers, this one also comes with the pouring shield as standard, so you can easily add ingredients as you go with no muss and no fuss. Of course, it still comes with the regular whisk and beater accessories, 10 speeds as well, and it also has the power hub port for all of the other powered options that are available. First of all, any KichenAid mixer is one of the most respected and functional units made. Regardless of any one you get, it will be durable, it will come with a 1 year limited warranty, and you’ll be proud to own one. If you just want a darn fine mixer and don’t plan on using it for making bread or stiff cookie dough, the Classic should suit your needs. Can it knead dough? Certainly, but if you do that regularly, the motor won’t be up for the task. This unit is better served making cake batter, frosting, mashing potatoes and other lighter fare. It is also the least expensive KitchenAid mixer available, and it’s a good place to start if you are a beginner baker or you just want to jump into the KitchenAid mystique. If cookies and bread are something you want to tackle, the Classic Plus, with a bit more power, would be better for the job. Now, understand that 25 more watts doesn’t mean it is heavy-duty, but for the occasional desire to make bread or cookie dough, this would be a much better choice than the Classic. It will cost you a few extra dollars, but in most cases, it’s always better to have a bit more power on hand. Just the fact that there will be less strain on the motor may be a deciding factor right there, but also for that extra cost, it will give you a shade more versatility overall. There are a couple of deciding factors here. If you want a mixer to match your kitchen decor, this might be your only choice. The array of colors is outstanding, and if you can’t find something that matches, then that color doesn’t exist! The other main factor is the boost in power up to 325 watts. Granted, this still isn’t a particularly heavy-duty unit, but it will do bread and cookie dough much easier than the other two. And if cookies and the occasional home-made bread dough are something you love to make, this is a better machine for that task. The mixing bowl is a hair larger, but that means being able to make a larger cake or bread loaf and even an extra batch of cookies. The bowl’s handle makes lifting it so much easier too. Plus, the more powerful motor lends itself better to the add-on powered accessories. The grinder will work easier, the pasta maker will run smoother, and virtually any powered hub accessory will work better. And once again, a more powerful motor automatically means more durability over the long run. Of course, you’ll pay about 1/3rd more for an Artisan, and it only comes with one extra accessory as standard; the pouring shield. But the better bowl, extra power and color selection makes it a more rounded and useful unit overall. The reality is that, you always want to get the best appliance that you can afford, and if you can afford a KitchenAid Artisan, it won’t do you wrong no matter what you want to mix, whip or knead. I have had a k45 kitchenaid since 1977.it has done everything including making pizza dough and breads. We had pizza double batches almost every week.it stopped working last week .I think it needs a power cord. I do not think I need an artisan. Are the newer ones as good ? Mine was made by hobart. The Classic Plus comes in more than just white. I have one that is silver. The Classic Plus is no longer available in silver and any 275 watt ones are now available only in white. The KitchenAid website has all models listed. The silver is available at Macy’s. Just saw it yesterday in Atlanta area. Apparently the silver is unique to them – they did not carry the white one at all. Kitchen Aid mixer are No longer maid with metal gears ! Plastic gears wear fast ! and get yourself biggest watt power you can get.